The Mercedes Benz S-Class is the reason why this class of cars exists. What do you need to know before you buy an S-Class? Don’t worry, we’ll tell you everything right here in the Ultimate Buyer’s Guide. The “S” in “S-class” stands for “sonder.” It’s a German word that means “special,” and that’s a very fitting name for this car, as the S-Class makes its occupant feel like a bonafide monarch. No, not the butterfly; a powerful head of state. A king or emperor. Someone who can wreck entire economies with nothing but a stern gaze. Mercedes makes some of the finest, most over-engineered cars on earth, and the S-Class is at the top of their range. It is one of the most opulent, technologically advanced luxury cars on earth. If you’re good at what you do there’s a moment in your life when you realize you’ve got the ability to change someone’s life for the better or absolutely ruin it. You can give them that promotion and that chance to succeed. You can fire them. That sense of power and control is roughly akin to the feeling you get when driving an S-Class. You are the elite. Like all previous iterations of the S-Class it is a large sedan that’s as comfortable as a mega-yacht but as maneuverable as a slightly smaller mega-yacht. This idea has been refined over generations and now the S-Class glides along the road as if on a magic carpet coated with grease and made of the finest leathers. When you pull around a turn, if so appointed, the seat will gracefully cup your body to make sure you don’t have to use any of the muscles in your abdomen to stay upright. It will do this while pulling itself to 60 MPH in a scant four seconds, massaging your upper back, and spraying a pleasing scent into the cabin. 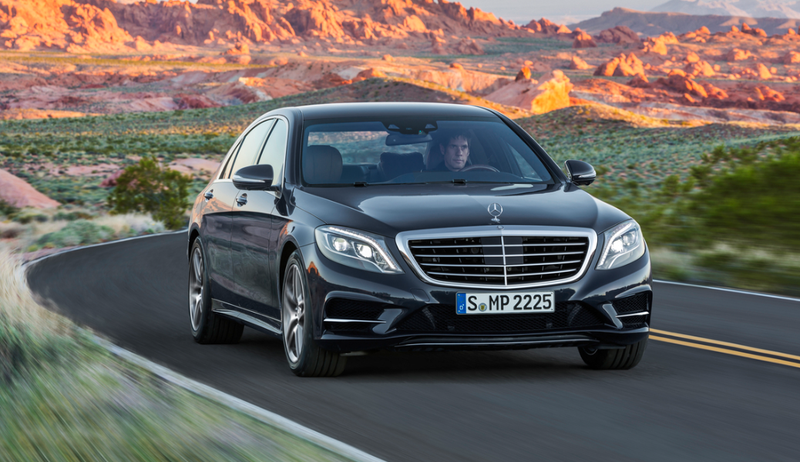 The W222 generation S-Class launched for the 2014 model year with a laundry list of new state-of-the-art safety and technology features. For example: Pre-Safe braking with pedestrian recognition, Active Lane-Keeping Assist, MAGIC BODY CONTROL with road surface scanning and even scented cabin air. The car launched with a pair of V8s, but in 2015, Mercedes brought in the big guns: two 6.0-liter V12s for the S600 and AMG S65 trims making 523 and 621 horsepower, respectively. 2015 also brought the new coupe S-Class into the mix. Mercedes made few changes for the 2016 model year. Engine power numbers are big. Very big. A powerful person is best matched with a powerful car, and on that front, Mercedes isn’t messing around. Every non-hybrid S-class makes over 500 lb-ft of twist and at least 449 horsepower. Granted, at over 4,600 pounds, the S-class isn’t exactly svelte, but boy did Mercedes overcompensate with these engine options. The most powerful 6.0-liter V12-powered AMG S65 makes a ridiculous, tarmac-moulding 738 lb-ft of torque. That’s almost 90 more torques than are made by Dodge’s supercharged 707 horsepower 6.2-liter Hellcat V8. That’s enough power to get this land yacht to 60 in four seconds. All things considered, the fuel economy numbers aren’t half bad. Even the insane AMG S65 with its whopping 738 lb-ft of torque will manager 20 MPG on the highway. The 449 horsepower base S550 doesn’t do too bad with fuel, either, managing 20 MPG combined. That’s better than a Chrysler 300 with a Hemi. So, overall, fuel economy numbers are decent considering the car’s heft and power numbers, but nothing to write home to the kids about. The S-Class comes in coupe and sedan form. The coupe comes in either S550, AMG S63 or AMG S65 form, while the sedan comes in S550, S550e, S600, AMG S63 and AMG S65 trims. Steering is electric and suspension is multi-link with air springs all the way around. Disc brakes in the front are 14.6 inches in diameter on the S550 and S600, while the AMGs get 15.4-inch pizzas. Rear rotors are 14.6-inches across. S550: Starts at $95,650. Notable standard features: 4.7-liter biturbo V8, 7-speed automatic transmission, 18-inch alloy wheels, AIRMATIC air suspension with adaptive damping, start/stop technology, Collision Prevention Assist Plus (ensures appropriate following distance and applies brakes to prevent accident), Attention Assist (prevents drivers from falling asleep), Pre-safe (tightens seat belts, adjusts head restraints and passenger seat and closes windows just before an accident), adaptive braking, 11 airbags, LED daytime running lights and taillights, LED adaptive headlights, highbeam assist, heated wiper, heated windshield washer, rearview camera, keyless start, soft-close doors, alarm system, heated 16-way power front seats with memory, power tilt/telescoping steering column, wood/leather steering wheel, panorama roof, power rear window sunshade, dual-zone automatic climate control, cabin air purification and fragrance system, rain-sensing wipers, heated mirrors with power fold-in, dual 12.3” touchscreens, COMAND infotainment system with navigation, surround sound, Bluetooth, NFC technology. Notable options: Premium Package: Vented front seats with rapid heating feature, active massaging front seats, active parking assist, power rear-side window sun blinds, hands free trunk access ($4,500); Driver Assistance Package: Adaptive cruise control, Pre-safe with pedestrian recognition, cross-traffic alert, active blind spot assist, lane keep assist, traffic sign assist (2,800$ + Premium Package); Warmth & Comfort Package: heated steering wheel, power rear seats with memory, heated and vented outboard rear seats with rapid heating, heated front and rear center armrests and door armrests (2,600$+Premium Package); Rear Seat Package: 4-zone climate control, power right-rear footrest, right-rear passenger power controls for front seat, outboard rear seat belt airbags ($3,000+Warmth & Comfort Pkg); Rear Seat Entertainment System: Large monitors built into head restraints ($2,650); Executive Rear Seat Package: Outboard rear seats with massage feature, executive right rear seat with added recline angle and calf rest (3,500$+Rear Seat Entertainment System & Rear Seat Pkg); Executive Rear Seat Package Plus: Two-passenger rear cabin with dual power rear seats, wood-trimmed center console with dual-folding tables and heated and cooled cup holders ($1,950+Rear Seat Pkg). S550 4Matic Coupe: Starts at $121,550. Notable standard features over S550 sedan: Two-door coupe design, all-wheel drive, Parktronic with Active Parking Assist, heated and vented front seats. Otherwise similar features to S550. Notable options: Premium Package, Driver Assistance Package, Warmth & Comfort Package. S550e: Starts at $95,650. Notable standard features over S550: 3.0-liter bi-turbo plug-in hybrid drive with 4-mode drive selector, 19”alloy wheels. Notable options: All-wheel drive ($3,000); Otherwise same options as S550. AMG S63: Starts at $143,250. Notable standard features over S550: All-wheel drive, 5.5-liter biturbo V8, unique 20” alloy wheels, adaptive sport suspension with AIRMATIC and ESP Curve Dynamic Assist, Keyless Go with Hands Free Access, vented front seats with massage, power rear-side window sun blinds, unique headliner, Parktronic with Active Park Assist. Same options as S550 minus Premium Package (it’s standard). AMG S63 Coupe: Starts at $163,150. Notable options over AMG S63: two-door coupe design, Surround View system, otherwise similar features to AMG S63 sedan. Notable options AMG S63: Driver Assistance Package, Warmth & Comfort Package. S600: Starts at $169,050. Notable standard features over S550: 6.0-liter biturbo V12, MAGIC BODY CONTROL suspension, unique 19” wheels, Night View Assist Plus, Rear seat-belt air bags, PRE-SAFE rear seat-belt buckles, adaptive cruise control, PRE-SAFE Brake with pedestrian Recognition, BAS PLUS with Cross-Traffic Assist, Pre-SAFE PLUS rear-end collision protection, Active Blind Spot Assist, Active Lane Keep Assist, Traffic Sign Assist, PARKTRONIC with Active Parking Assist, Surround View System, Keyless-Go with Hands-Free Access, vented front seats with massage, heated center front armrest and front-door armrests, heated and vented power rear seats with memory, executive right rear seat with power calf rest and massage, heated rear armrest and rear-door armrests, heated steering wheel, power rear-side window sun blinds, 4-zone automatic climate control, unique headliner, head-up display, 3D Surround Sound. Notable options: Executive Rear Seat Package Plus: Two-passenger rear cabin with dual power rear seats, wood-trimmed center console with dual-folding tables and heated and cooled cup holders ($1,950). AMG S65: Starts at $224,650. Notable standard features over S600: 621 hp 6.0-liter turbo V12, unique 20” alloy wheels, AMG Active Sport Suspension with MAGIC BODY CONTROL and ESP Curve Dynamic Assist, Nappa leather headliner. Similar options as S600. AMG S65 Coupe: Starts at $234,050. Notable standard features over AMG S65: Two door coupe design, otherwise similar features and options to AMG S65.. If we were on the market for an S-Class, we’d get the 612 lb-ft twin-turbo V12-powered S600. Not only does that get us a strong engine, but the S600 is completely decked out. That humongous list of standard features includes MAGIC BODY CONTROL (which scans the road ahead and adjust suspension settings accordingly), Night View Assist, adaptive cruise control, Surround View System, vented, heated and massaging seats, 4-zone climate control and heaps of other safety and tech gadgetry. It’s the crème de la crème of the S-Class, making it the crème de la crème of luxury cars.